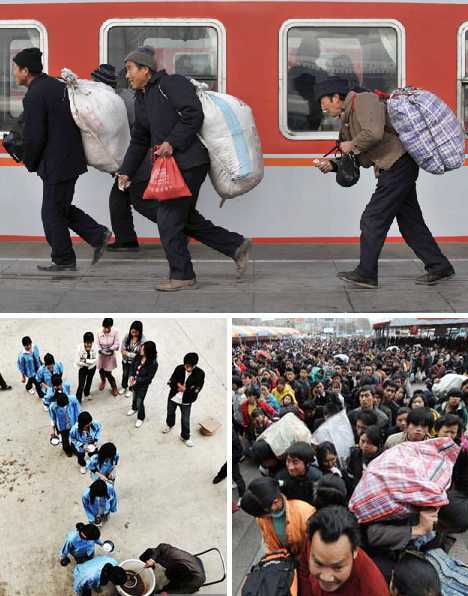 All across China, millions of migrant workers are on the move, looking for jobs and – once they’ve found them – places to live. At the same time, China’s booming economy has generated a vast surplus of metal shipping containers. 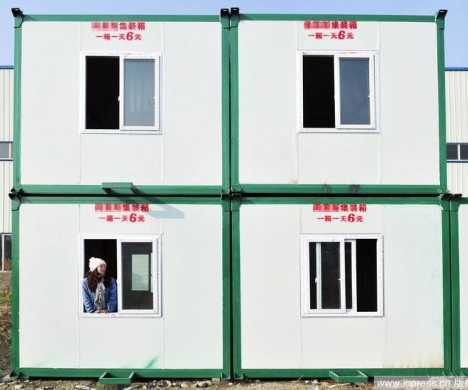 Savvy city authorities are finding that converting these cargo containers into cheap, basic apartments uses up extra containers while satisfying tenants with low expectations and incomes to match. China’s amazing economic boom has mainly been powered by cheap labor. Rural villagers escaping endemic poverty exacerbated by the closing of inefficient state-owned industries flock by the tens of millions to so-called “factories without chimneys”: mainly coastal cities desperate for cheap labor. Current estimates peg China’s “floating” population of migrant workers at around 120 million, a sobering figure that is growing at the rate of 13 million people per year and could hit 400 million by 2025. Already China’s overheated construction industry is having trouble providing homes for its upwardly mobile citizens. Rising demand for housing leads inexorably to rising prices for housing, and migrant workers often arrive in urban centers with little more than the shirts on their backs. 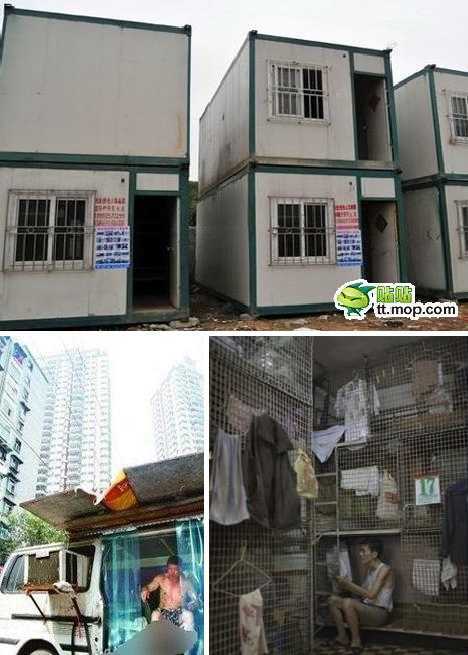 Some will live anywhere – like a group of 10 living in a public toilet (above, top). What to do? 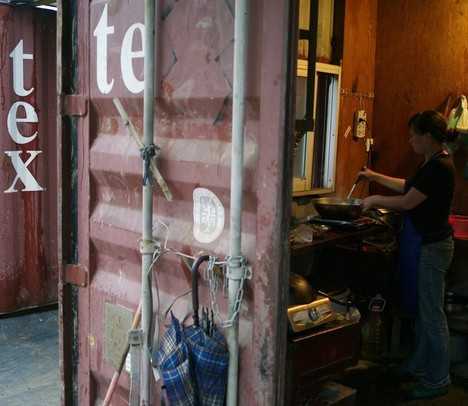 One solution seized upon in the coastal cities revolves around steel shipping containers. It’s rather elegant, in a way: faced with an oversupply of cargo containers and homeless workers, why not turn the former into homes for the latter? Above are some so-called “snail houses” in the city of Foshan. 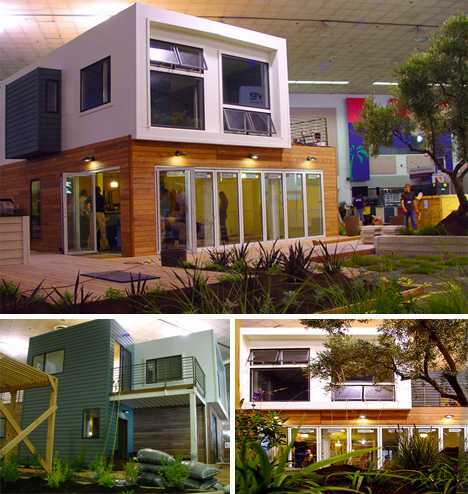 Shipping containers have been successfully converted into homes, offices, hotels and more – often the conversions are so elaborate you’d never know the structures’ origins. All well and good, but China’s situation demands quick, cheap fixes. Consider the plight of a migrant worker from a rural village without electricity, plumbing or a roof that doesn’t leak. 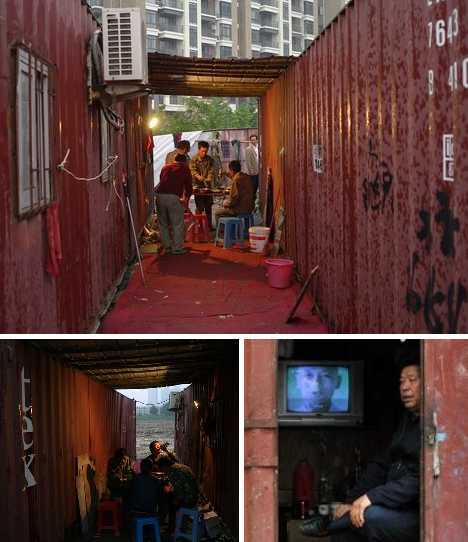 Even the most basic converted cargo container would seem like a palace while costing a pittance. 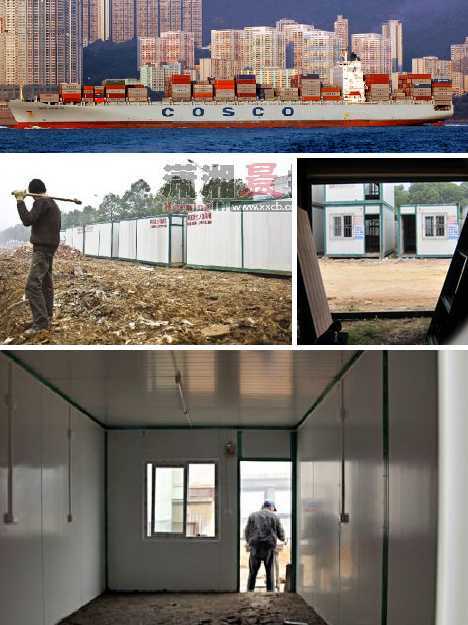 Cargo container communities have been springing up all across China’s manufacturing centers, beginning with port cities where surplus shipping containers are cheap and abundant. 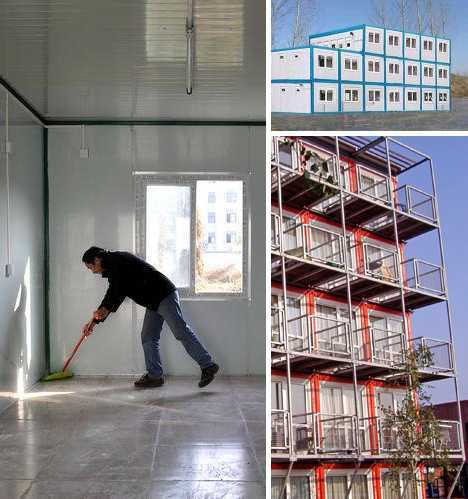 The success of these converted containers as cheap housing has resulted in cities located inland to import the containers and build housing complexes with them. A perfect example is Chengdu, a city of about 11 million that is the capital of Sichuan province in Southwest China. Lured by lower land costs and much-improved infrastructure, companies are setting up shop in Chengdu and migrant workers are answering the call for laborers. Generally, male migrants work in construction while females are hired to work in factories requiring repetitive small-scale assembly and piecework. 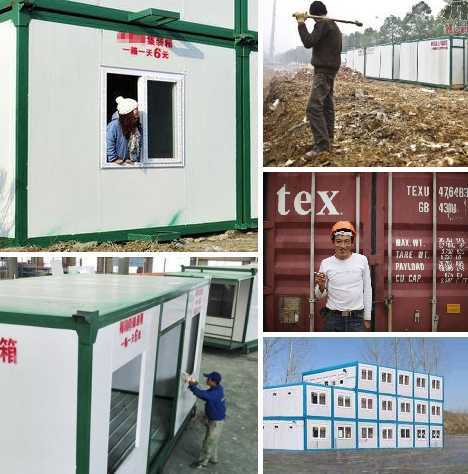 The hours are long, the pay is low, and housing is at a premium… bring in the container apartments! The cargo container apartment complex highlighted here was one of Chengdu’s first, set up in late 2010 along the Qingpai Dadao (Qingpi Avenue) in Chengdu’s central Wenjiang district. The complex is made up of standard-issue 3m x 6m (roughly 10 by 20 ft) steel shipping containers that weigh 2.6 tons each. The units do have some creature comforts such as fluorescent lighting, electrical wiring and fittings for air conditioners. Openings are drilled for telephone cords though many tenants use inexpensive cell phones. Some units consist of two containers stacked one atop the other and feature an upstairs balcony. As for water and plumbing, remember that while not all of China’s rural villages are without modern household conveniences and facilities, usually the poorest villagers become migrants in the hopes of building a better life. 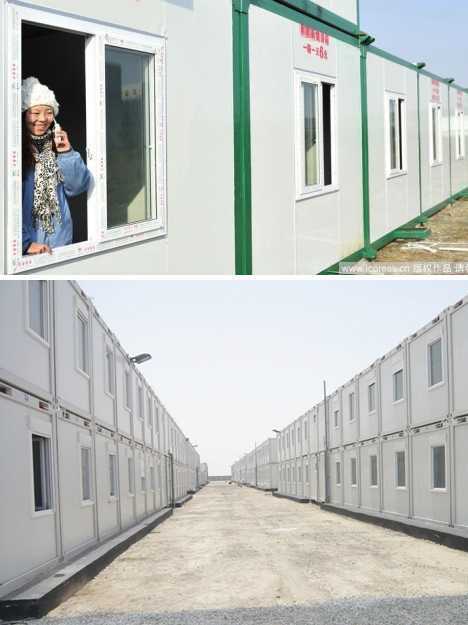 Basic bathroom facilities (including a shower) are built behind the rear portions of the containers and small kitchens are fitted into a corner of the first floor. Still sound kinda rough? 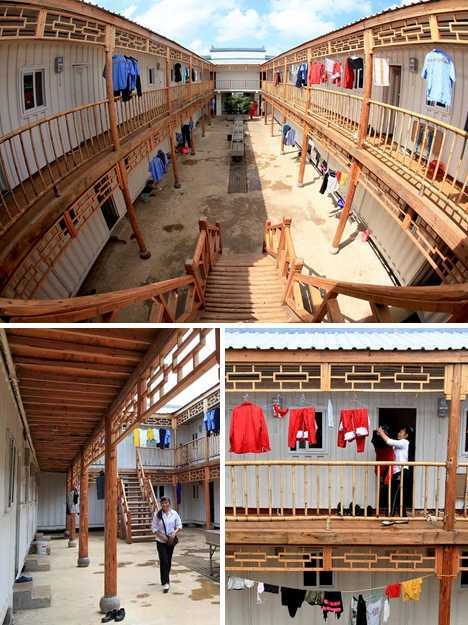 Be aware that even among container homes there’s a hierarchy – the “homes” above in Fuzhou are part of a group of 13 that really scrape the bottom of the barrel. 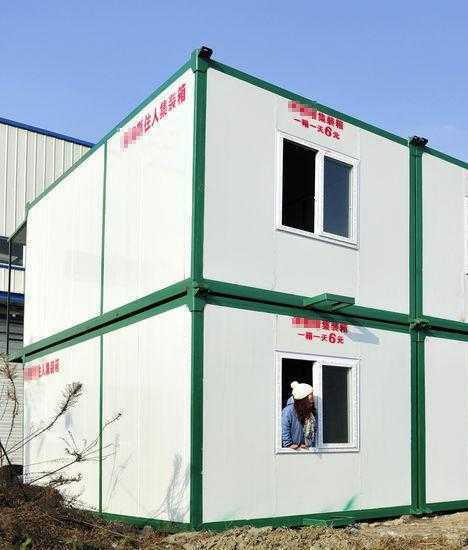 Painted white with dark green trim, Wenjiang cargo container apartments are neat and unobtrusive. In fact, they look a lot like an ordinary block of flats until one gets close enough to read the rental phone number and daily rental cost stenciled on each unit in red paint. Speaking of which, that daily rental cost is 6 yuan, slightly under $1 at current exchange rates. 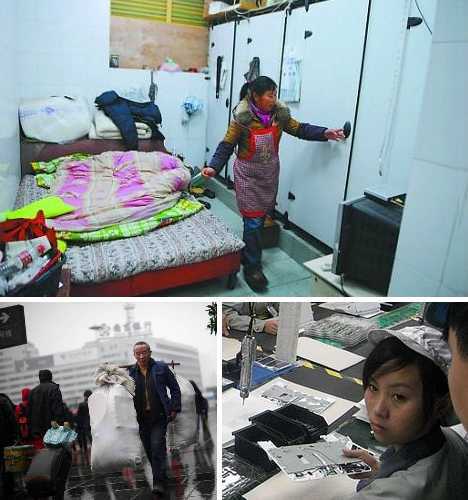 Tenants wanting to pay by the month are charged 180 yuan. You can even buy one outright for a flat 10,000 yuan ($1,540). 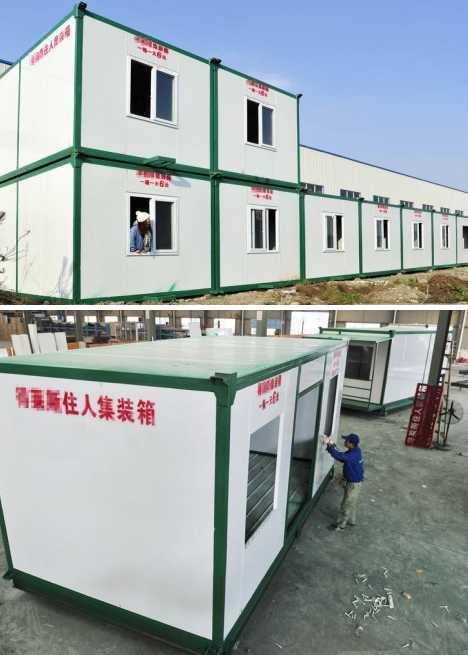 If one considers that the cargo container apartment units are built to accommodate up to 10 tenants per unit and some are furnished with 5 bunk beds, the economics are even more, shall we say, accommodating!